Over the past year or so there have been some major changes in how to get from Siem Reap to Kampot (and from Kampot to Siem Reap). From fantastic new bus companies, to the very best taxi services, to more convenient flights from Siem Reap to Sihanoukville, it has never been easier to get from one city to the other. Here’s all the latest information on buses, taxis, and flights between Siem Reap and Kampot. On average a private taxi from Siem Reap to Kampot will cost in the region of $150 (that’s usually the quote from Siem Reap airport to Kampot). You’ll have the option of stopping for toilet breaks, coffees, and even sightseeing if you wish. There are many bus companies offering economy and VIP buses between Kampot and Siem Reap. Although companies such as Giant Ibis and Mekong Express used to be the only services a few years ago, there are now several new options including Virak Buntham and Phnom Penh Sorya. Of these, we would still say that Mekong Express is probably your best option, though Virak Buntham and Phnom Penh Sorya are of a good standard. In general, an economy bus is about $15 on average and sits roughly 50 people. VIP buses are smaller and more comfortable, sitting around 15 people. They are a bit more expensive at $20 one way. VIP buses tend to be quicker (11-12 hours) than economy buses (12-13 hours), and the journeys are more convenient (e.g. you can ask the driver to stop if you desperately need to go to the toilet). Both types will stop along the way for short toilet and snack breaks, and with most services you will have to change along the way. To give you an idea of bus times, here are the timetables for some of the most popular and best reviewed services (Mekong Express, Giant Ibis, Virak Buntham, and Phnom Penh Sorya). Siem Reap to Kampot: 7.30am and 8.30am. Kampot to Siem Reap: 8.15am and 4.35pm. Siem Reap to Kampot: 2.45pm and 11pm. Kampot to Siem Reap: 7.45am. Siem Reap to Kampot: 8.00pm. Kampot to Siem Reap: 8.00pm. Siem Reap to Kampot: 6.30am, 7.30am, 11.30pm. Kampot to Siem Reap: 6.30am, 7.30am, 11.30pm. To save you some time, you might prefer to take a flight from Siem Reap to Sihanoukville, and then a taxi / bus from Sihanoukville to Kampot. There are now several airline companies that fly direct between Siem Reap and Sihanoukville, including Cambodia Angkor Air, Cambodia Bayon Airlines, and JC International Airlines. Of these, Cambodia Angkor Air (the national carrier of Cambodia) tends to be the best reviewed. 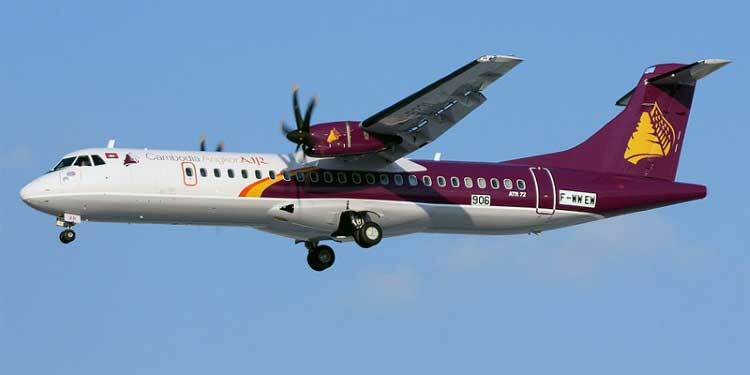 It uses an ATR 72 for domestic flights between Siem Reap and Kampot (pictured below).